Identification. It is said that the mainland portion of what is now Tanzania was named by a British civil servant in 1920, from the Swahili words tanga (sail) and nyika (bright arid plain). Thus what was known formerly as German East Africa became Tanganyika Territory. In 1964, Tanganyika was joined with Zanzibar, an offshore archipelago of islands, to form the present United Republic of Tanzania. Because of a unique combination of historic and cultural factors, Tanzanians share strong feelings of national pride and cohesion. This sense of nationalism has served to keep the country at peace for over two decades, while most of its neighbors have been involved intermittently in catastrophically destructive civil and cross-border wars. Tanzanians have been able to resolve most internal problems without resorting to violence because of a shared language, the lack of political or economic dominance by any ethnic group, and the strong leadership provided by Julius Nyerere (1922–1999), the first president of Tanzania. At the same time, however, repressive, corrupting influences emanating from the colonial, socialist, and capitalist eras have fostered among many Tanzanians an attitude of dependency and fatalistic resignation that helps keep the country one of the poorest in the world. Location and Geography. Covering approximately 365,000 square miles (945,000 square kilometers)—an area about one and one-half times the size of Texas, Tanzania lies on the east coast of Africa, just south of the equator. It shares borders with Kenya, Uganda, the Democratic Republic of the Congo, Rwanda, Burundi, Zambia, Malawi, Mozambique, and the Indian Ocean. Tanzania also shares three great lakes—Victoria, Tanganyika, and Malawi—with its neighbors. The country is comprised of a wide variety of agro-ecological zones: low-lying coastal plains, a dry highland plateau, northern savannas, and cool, well-watered regions in the northwest and south. The 120 ethnic groups that inhabit Tanzania have adapted to a wide range of geophysical and climatic conditions. The specific habits, customs, and life-views of each group have been influenced by tribal traditions and alliances, European invasions, population movements over the centuries, and introduced and endemic diseases. In the late 1990s, the central political administration was moved from Dar es Salaam on the Indian Ocean coast to the more centrally located city of Dodoma, which lies in the middle of the central plateau. Because of Dodoma's dry climate, relative lack of economic development, and small size, however, the port of Dar es Salaam remains the urban center of national importance. Demography. The current population in Tanzania is approximately 30 million, comprised of indigenous peoples and Pakistani, Indian, Arab, and European subpopulations. There are heavy population concentrations in the urban centers (including Dar es Salaam, Mwanza, Tabora, and Mbeya), in the foothills of Mount Kilimanjaro, and along the coast of Lake Malawi. trade, political debate, nationalism, information dissemination, and conflict resolution. Symbolism. Mount Kilimanjaro, the highest peak in Africa, and the magnificent wild animals (including lions, elephants, rhinoceros, giraffes, leopards, and cheetahs, to name only a few) draw millions of tourists to the country every year. The landscape and animals are valued national treasures, symbolized on coins and as brand names for manufactured products. Severe depredations by poachers from both inside and outside the country, however, continue to threaten the survival of many species. The torch of freedom ( uhuru ) and the figure of a soldier (representing the sacrifice of veterans and the war dead) are also common symbols throughout the country. Elegant ebony carvings of both representational and modern design, a specialty of the Makonde people of southeast Tanzania, are prized by collectors around the world. Tanzania was cradle to some of the earliest hominids on earth, made famous by the discoveries of Louis and Mary Leakey at Olduvai Gorge. Bantu-speaking peoples migrated to eastern Africa at the same time that trade between Arabic-speaking peoples and coastal populations was initiated in the first century B.C.E. By the twelfth century, Arab trading posts were well established along the coast and on some islands. Although Vasco da Gama landed on the East African coast in 1498, it was not until 1506 that the Portuguese fully controlled trade on the Indian Ocean. The Arabs had been trading along the coastline for centuries when Sa'id ibn Suttan moved his capital from Oman to Zanzibar in 1840 to take advantage of the slave markets. During the early nineteenth century, Arab slave and ivory traders began to penetrate deeper into the interior of what was to become Tanzania. In 1890, Zanzibar became a British protectorate while the mainland became part of German East Africa. The period of German rule was extremely heavy-handed; when the Africans fought back during the Maji-Maji rebellion of 1905, tens of thousands were killed. After the defeat of Germany in World War I (1914–1918), German East Africa was made a League of Nations Mandated Territory, called Tanganyika, controlled by the British. Following World War II, Tanganyika became a United Nations trusteeship of Great Britain. Adhering to a policy of "indirect rule," the British government used indigenous political systems to implement their control, thereby resulting in much less open hostility than occurred during the time of German rule. Emergence of the Nation. The birth of nationhood may be attributed to the earlier independence of other African nations along with a growing sense of unity and a need to become independent from the British colonial government. Independence was achieved without bloodshed. Julius Nyerere was elected president of the Tanganyika African Association, later renamed the Tanganyika African National Union (TANU), in 1953. African officials elected to TANU in 1958 and 1959 constituted the administration for internal self-government in May 1961. On 9 December 1961, Tanganyika was proclaimed an independent nation. In 1963, Zanzibar was granted independence from Great Britain, and in 1964 an Act of Union was signed between Tanganyika and Zanzibar to form the United Republic of Tanzania. National Identity. The national identity is influenced by several factors. One of the most important integrating forces is the use of the national lingua franca—Swahili, a language spoken and revered by nearly all Tanzanians. Swahili is a compulsory subject in schools, and some 83 percent of the population are literate. Equally important, of course, is Tanganyika's independence and subsequent unification with Zanzibar to form the United Republic. Perhaps the most important influence on a sense of national identity was the development of Tanzanian socialism. The creation of Nyerere, Tanzanian socialism was codified in the Arusha Declaration of 1967. Both the symbolic and practical cornerstone of Tanzanian socialism was ujamaa , a Swahili word meaning "family" or "familyhood." The core structure of ujamaa is the traditional extended family and clan structure of most ethnic groups, which provides a framework for mutual assistance and cooperation. It was believed this structure would provide the foundation for socialist production. In practice, the forced resettlement of rural populations into ujamaa villages was met with great local opposition, and Tanzanian socialism has largely proven to be an economic failure. The concept of ujamaa and mutual assistance, however, did infiltrate the national ethos; they are represented, for example, in elaborate ebony carvings of intertwined figures, standing upon or grasping one another in expression of mutual support and social collectivity. National resources also contribute to a sense of national identity. For example, at 19,340 feet (5,895 meters), Mount Kilimanjaro is the highest point on the African continent. This beautiful, now quiet volcano is located near Arusha, the major tourist city in the nation. Wildlife safaris to the Serengeti Plain and the world's largest caldera, Ngorongoro Crater, are initiated from this city. Few Tanzanians, however, are wealthy enough to afford such luxuries, and many never see the wildlife Westerners associate so closely with Africa. Finally, Lake Victoria, the second largest freshwater lake in the world and source of the Nile, is an important symbolic and natural resource—although it is shared with Uganda and Kenya. Ethnic Relations. Within the borders of Tanzania co-exist approximately 120 ethnic groups speaking languages representing all four major African language groups. These include Khoisan, or "click"speaking hunter-gatherers, Nilotic-speaking pastoralists (such as the Maasai), Cushitic speakers, and Bantu speakers; the latter predominate in terms of population size. The largest ethnic groups include the Sukuma (over three million), and the Chagga, Haya, and Nyamwezi (over one million each). Despite the tremendous cultural and linguistic diversity among Tanzanians, ethnic groups are united by the use of a common language—Swahili—and a sense of national identity. The growing number of refugees (from neighboring Rwanda, Burundi, and Uganda in particular) do not appear to have caused serious ethnic tensions, but they have become a serious strain on the economy and the local environment. The architecture of urban coastal centers reflects the long, rich history of Tanzania. Ruins of Arab mosques, cemeteries, and house structures can be found at sites such as Kaole, just south of Bagamoyo. Tombs embedded with Chinese ceramics dating to the twelfth century reflect the trade between distant civilizations. 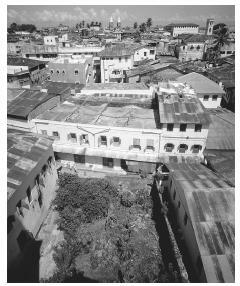 Nineteenth-century stone houses on narrow streets characterize Bagamoyo, which was one of the main endpoints of the East African slave trade. Founded in the 1860s by Sultan Seyyid Majid of Zanzibar, Dar es Salaam, which most likely means "house of peace or salvation," is the main commercial center. Looking out over the Indian Ocean, the sails of dhow fishing vessels are dwarfed by transoceanic cargo ships gliding into the port. Architectural styles reflect Arab, German, and British influence and occupation. Major buildings include elaborate mosques and churches, such as the German-style Lutheran Church. One of the largest public gathering locations in all Tanzanian cities and towns is the marketplace, where meat, produce, housewares, and a variety of miscellaneous items are sold. In addition, football (soccer) stadiums are important areas where people convene in Dar es Salaam and in all large urban areas. One of the most visible monuments in the center of Dar es Salaam is the Askari , or "soldier," which was unveiled in 1927 and commemorates the loss of African troops during World War I. The most significant monument is the Uhuru , or "freedom," torch commemorating Tanganyika's independence from Great Britain in 1961. Only about 10 percent of Tanzania's people live in urban areas. beehive-shaped house of the Haya, who live on the western shore of Lake Victoria, to the long, rectangular houses made of wood and thatch of the Gogo people in central Tanzania. Each ethnic group's traditional house structure has a corresponding cultural logic that determines the use of space. For example, the Haya traditional house is surrounded by a banana plantation; an area in front of the house used for relaxation and food drying is kept free of debris by daily sweeping. The interior of the house is divided into separate use areas, some reserved for men; some for women, children, and cooking; some for animals; and one for honoring ancestors. Traditional houses are being replaced increasingly by rectangular, "European"-style houses made from a variety of materials, including brick, wood, earth, and thatch. Unlike in traditional houses, cooking areas have been moved outside. Food in Daily Life. For most Tanzanians, including those who live in urban areas, no meal is complete without a preferred staple carbohydrate—corn, rice, cassava, sorghum, or plantains, for example. Plantains are preferred in the northwest, ugali (a thick mash of corn or sorghum) in the central and southwestern regions, and rice in the south and along the coast. The staple is accompanied by a fish, beef, goat, chicken, or mutton stew or fried pieces of meat, along with several types of vegetables or condiments, commonly including beans, leafy greens resembling spinach, manioc leaves, chunks of pumpkin, or sweet potatoes. Indian food (such as chapatis , a flat bread; samosas , vegetable or meat-filled pastries; and masala ,a spiced rice dish), is widely available in all urban areas. Breakfast preferences depend on income levels and local tradition: bread, sweet rolls or biscuits ( mandazi ), coffee or tea (sometimes with spices, sugar, and/or milk), buttermilk, and chicken broth are the most common foods. Finger foods sold on the streets include fried plantains and sweet potatoes, charcoal-roasted corn on the cob (with no butter or salt), small bags of peanuts and popcorn, pieces of dried or fried fish, samosas , bread, fruit, dates, hard candy, gum, and mishikaki , or shish kebabs of beef or goat grilled over a charcoal fire. In local bars selling homemade brews or bottled spirits and pop, it is common to eat roasted meat—beef or goat; often the meat will be flavored with hot peppers, salt, and fresh lime juice. Food Customs at Ceremonial Occasions. Without exception, all ceremonial occasions demand the preparation of enormous platters of food, such as pilau , a spiced rice, potato, and meat dish that caters to local tastes and culinary traditions. It is considered very shameful for guests to leave hungry from a ceremonial meal or dinner party. Except among religions that forbid it, alcohol is also an integral—and sometimes highly symbolic—part of ceremonies. Local beers and spirits derived from bananas, corn, rice, honey, or sorghum are served alone or alongside manufactured alcoholic beverages. Konyagi, a ginlike spirit, is brewed commercially in Tanzania as are a variety of beers and soft drinks. Certain beers produced in neighboring countries—Primus, from Burundi, for example—are also popular. Basic Economy. Agriculture provides the mainstay of the Tanzanian economy, still employing close to four-fifths of the economically active population. Farmers grow food for subsistence and for sale. Minerals, precious metals, fish, timber, and meat are also important products. Land Tenure and Property. Although Tanzania is one of the least densely populated countries in eastern Africa, control and access to productive lands has become an increasingly contentious issue. Following independence, national laws were enacted to provide the state with ownership of all lands, granting citizens use rights only through short- and long-term leases. At the local level, however, different sets of traditional tribal laws pertain. Since the demise of socialism and the penetration of the market economy, customary or tribal claims to land have clashed with the national laws. Throughout Tanzanian history, few customary laws have permitted women, who perform the bulk of agricultural labor in the country, to own land. While national laws have been modified to enable women to buy or inherit property, these changes challenge—and are often overruled at the local level—by customary laws. Many analysts believe that enhanced access to and control of land by women would result in significant increases in agricultural production. Commercial Activities. Agricultural and manufactured products are sold both retail and wholesale. The informal economy in Tanzania is significant, petty hawkers making up the bulk of traders. Second hand clothing, household goods, cloth, and foodstuffs dominate the informal trade. Forced licensing and taxation of small-scale businesspeople has caused some friction between the government and citizens, leading on multiple occasions to demonstrations and local resistance. Major Industries. Most of the industrial production is geared toward local commodities. Important industries include food processing and the manufacture of textiles, alcoholic beverages, and cigarettes. Other industrial activities include oil refining, and the manufacture of cement, gunnysacks, fertilizer, paper, glass, ceramics, and agricultural implements. Because of the relatively unspoiled game parks and only rare incidents of insecurity, tourism is a growing industry. Trade. The most important commodities include cotton, fish and shrimp, coffee, cashew nuts, cloves (grown mainly on the offshore islands), tea, beans, precious stones, timber, sisal, sugar, pyrethrum, coconuts, and peanuts. Textiles, clothing, shoes, batteries, paper, and cement are examples of products commonly sold to neighboring countries. Throughout most of the country, however, production and marketing are severely constrained by very poor infrastructure, from roads and railroads to communication and power networks. During the socialist period, many products of inferior quality—from hardware to bicycles—were imported from China and other socialist countries. Today, a much wider variety of higher quality items from many countries around the world are available in shops and markets, although their high prices often prohibit all but the wealthy from purchasing them. Division of Labor. Customary divisions of labor generally relegate the heaviest physical labors (for example, clearing of fields, cutting trees) to men and lighter tasks to women. Similarly, few women work with machines and other highly valued productive assets. Children as young as three or four learn to help their parents with household and field chores, although girls often shoulder a much greater work burden than boys, a pattern that often repeats itself as children grow into adulthood. Professional positions are usually occupied by individuals who have had post secondary school education. Successful businesspeople may or may not have formal education, but often have relatives, friends, or patrons who helped finance the establishment of their business. Classes and Castes. Tanzanian society is divided along many lines. The traditional elite includes descendants of kings and paramount chiefs, who, after independence, lost their traditional titles. The modern elite includes many individuals in the government, successful businesspeople, and highly educated individuals. With the advent of the HIV-AIDS epidemic and the decrease in social services, the poorest families are no longer able to care for all of their children and relatives. Beggars in urban areas and street children have become more visible and are often victims of police brutality. Symbols of Social Stratification. Economic stratification became more pronounced during the German and British colonial periods, when certain ethnic groups or individuals who were favored for particular physical traits or skills were able to profit from a special relationship with the colonial hierarchy. Ownership of one or more automobiles, expensive hairstyles and Western clothing, large, Western-style houses with modern amenities, perfect command of English and/or other nonnative languages, and frequent travel are all markers of the upper classes. At the other extreme, many of the poorest Tanzanians are severely malnourished and clothed in rags, living constantly on the edge. The market economy has encouraged individual success, proliferation of Western goods, and systemic corruption, causing the gap between the rich and the poor to widen even further. 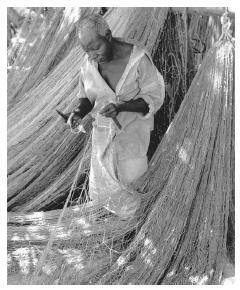 A Tanzanian fisherman mends his net in Nungwi, Zanzibar, Tanzania. Dried or fried fish is a staple food. Government. Modeled after the government of Great Britain, the United Republic of Tanzania developed a parliamentary system of government soon after independence. The highest positions include the president, prime minister, and chief justice. A term limit for the presidency was set at five years in 1984. In addition, two vice presidents were established to balance power between the mainland and Zanzibar. If the president is from the mainland, for example, one of the vice presidents must be from Zanzibar to help minimize the excessive influence of individuals. Leadership and Political Officials. Called Mwalimu or "respected teacher," Julius Nyerere was president of Tanzania for more than two decades (1964–1985). Widely revered throughout Africa and the world for his honesty, integrity, and wisdom, Mwalimu Nyerere was largely responsible for the enduring stability of the new nation. He is perhaps most noted for his attempts to help negotiate an end to violence in other African nations, including South Africa and Burundi. The former president and father of the nation died on October 14, 1999, at the age of 77. The impact of his loss to the nation and the continent is just beginning to be felt. Nyerere was succeeded by Ali Hassan Mwinyi, a Zanzibari native, who served two terms (1985–1995). Tanzania implemented a one-party political system for many years after independence. In 1977, the Tanganyika African National Union was merged with representatives of the Zanzibari Afro-Shirazi Party to form the Chama cha Mapinduzi (CCM) or the "Party of Revolution," with Nyerere as chairman. The CCM ruled unopposed until the first multiparty elections were held in 1995 when Benjamin William Mkapa was elected president. Many Tanzanian government officials are noted for their dedication and austerity, although corrupting influences of the market economy have become more prevalent over time. In a general sense, the authority of government officials at all levels is respected by local citizens, regardless of ethnic affiliation. This respect is demonstrated by greeting officials with a shaking of right hands, often while laying the left hand under one's right arm. This is also the proper way to receive a gift. Women and girls often bend down slightly on one knee (a modified curtsy) to greet officials and elders. Social Problems and Control. Tanzania has been less afflicted by large-scale social problems than its neighbors. Social conflicts due to religious differences have been relatively minor, although recent tensions between Muslims and Christians threaten to destabilize the unity between Zanzibar and the mainland. On 7 August 1998, terrorist bombings of the American Embassies in Dar es Salaam and Nairobi, Kenya, killed 81 people and injured hundreds more. Although the individuals responsible have not yet been identified, it has been suggested that organized Muslim fundamentalists outside of Tanzania may have planned the attack. In addition, there is long-standing tension between Asians (e.g., Indians and Pakistanis), who own most of the businesses in Tanzania, and indigenous Tanzanians. Theft is a serious social problem, especially in larger cities and towns. If a criminal act is witnessed by the public, often a crowd will punish the thief with a beating. With the exception of the military and police, very few people have access to guns. There is some evidence that Tanzanian ports are assuming an increased role in the shipment of illegal drugs destined for American and European markets. Some use of illegal drugs among the local population has surfaced, but the full extent is unknown. Military Activity. The Tanzanian People's Defense Force includes the army, navy, and air force; in 1998/1999, military expenditures were about $21 million. The most important military activity occurred in 1978–1979, after Uganda attempted to annex part of the Kagera Region in northwest Tanzania. Under the direction of Idi Amin Dada, Ugandan troops invaded the region, but were repelled by the Tanzanian army—at great expense to the nation. The war is vividly portrayed in local songs, and a monument commemorating the loss of Tanzanians stands in Bukoba, the Kagera Region's administrative headquarters. The dismal economic failure of Nyerere's socialist system in Tanzania opened up the country to the influences of international banking organizations that intervened—ostensibly to save the economy. Loans to rebuild the economy after the socialist period were conditioned upon cost-cutting structural adjustment programs that severely reduced the size of the government as well as the number and quality of social support systems. As a result, many Tanzanians have resorted to basic survival strategies, assisted in many parts of the country by foreign aid programs and church organizations. With the support of several Scandinavian countries, the high level of development assistance in Tanzania began in the 1970s and 1980s, and spawned a dramatic growth of nongovernmental organizations (NGOs). Many of these NGOs collaborate with international organizations (the United Nations and the International Committee of the Red Cross, for instance) and U.S. and European private voluntary organizations (CARE, Catholic Relief Services, Save the Children, and Doctors without Borders, for example) to implement a wide variety of projects in health, water and sanitation, agriculture, and microenterprise. Dozens of humanitarian aid programs—which rely on the availability and expertise of local NGOs—support an estimated 800,000 refugees currently in Tanzania who have fled conflict and political instability in the Democratic Republic of the Congo, Rwanda, and Burundi. NGO staff positions provide a very important avenue of employment for highly educated Tanzanians who are finding it difficult to secure civil service positions in a government downsized by structural adjustment. Increasingly, NGOs are competing with one another for limited development and relief funds. Most women in Tanzania have a lower standard of living than men. Division of Labor by Gender. In many rural areas of Tanzania, tribal customs advocate a gender division of labor: women and girls take care of the household chores, small children, and livestock, and plant and weed the agricultural fields. Men prepare land for cultivation, care for large livestock, market produce, and make the important financial and political decisions for the family. As girls and women throughout the country have gained access to more formal education, however, they are challenging the customary division of labor. Similarly, where conditions of extreme poverty obligate male heads of households to migrate in search of work, women in these communities have taken over some of the hard physical labor. 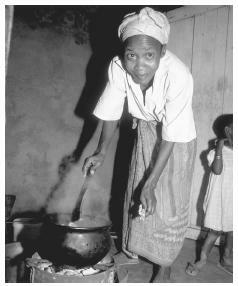 In many modern households in Tanzania, wives and husbands are challenging and questioning one another's changing roles. The disruptive effects of alcohol abuse, AIDS, and materialism have also placed great strains on relationships within and among families. The Relative Status of Women and Men. Among the lower socioeconomic strata, with few exceptions, women have a lower standard of living than do men. Generally speaking, boys are valued more than girls. Only women descended from ruling tribal families, successful businesswomen, or women politicians enjoy privileges equal to that of men. Among the formally educated there are conflicts between husbands and wives regarding the appropriate roles and responsibilities of each. When an activity undertaken by a woman becomes successful, her husband or a male relative will try to take control of the activity or the money it has generated, especially in rural areas. Traditional systems of social organization are still of great significance in the daily lives of Tanzanians. Kinship systems provide networks for support and become visible during all major life-cycle ceremonies. Marriage. In general, traditional marriage customs vary by ethnic group. The practice of clan exogamy—or marriage outside of the clan or group—is typical, however, of almost all ethnic groups. Traditional customs call for marriages to be arranged by the parents of the bride and groom, although such arrangements are becoming less common, particularly in urban settings. In patrilineal ethnic groups (those in which descent is traced through males), traditional marriage customs often include the presentation of a dowry or bride price to the wife's family by the bridegroom. The dowry may include livestock, money, clothing, locally brewed beer, and other items. The amount of the dowry is determined through negotiations between the families of the engaged. Preparations for marriage may take months. For those wealthy enough to afford it, marriage may include a separate dowry ceremony and, several months later, a church wedding followed by traditional ceremonies. Although many ethnic groups and Muslims allow polygyny (having more than one wife), the practice is decreasing in popularity, in part because of the influence of Christianity and the expense of maintaining several households. Domestic Unit. The basic family structure is extended, although the pressures of development have led increasingly to nuclear family units, particularly in urban areas. In most cases, the man is the supreme head of the household in all major decisions. A wife earns respect through her children and, indeed, is not considered to be a fully mature woman until she has given birth to a healthy child. In most ethnic groups, she is recognized by her eldest child's name and called, for example, "Mama Kyaruzi," after her eldest child of the same name. Children eat separately, often with their mothers. The market economy has placed significant pressure on the stability of the domestic unit and the extended family. Educated, wealthy family members are often called upon to provide resources to other family members for their education and general welfare. In many areas deaths due to AIDS have placed additional strain on the extended family. Inheritance. Tanzanian laws of inheritance vary according to ethnic group. There are also significant differences between national and customary laws of inheritance, which are settled in the court system. Generally speaking, boys and men are favored over girls and women in customary ethnic laws, in part to keep clan holdings together. (When women in patrilineal ethnic groups marry in Tanzania, they tend to live with or near their husband's family.) Nevertheless, the customary subdivision of land holdings—even just among sons—has already led to serious fragmentation of land in areas where arable land is scarce. In some groups, widows and divorcees are not adequately provided for through customary laws and must fend for themselves or be cared for by their children. This discrimination is being challenged by lawyers, affected individuals, and organized groups. Kin Groups. Clanship systems are common in most ethnic groups. While the majority of ethnic groups are patrilineal, recognizing descent through male ancestors, there are some matrilineal groups (where descent is traced through females) in Tanzania: the Kaguru in the east-central part of the country, for example. In practice the structure and function of clans differs significantly from one ethnic group to another. In some cases, they form well-recognized groups while in others they are dispersed. In general, an elder, or group of elders, is often responsible for settling disputes within the clan and for conducting various ceremonies to venerate the ancestors. Infant Care. Throughout the nation, children are raised with the strong influence of parents as well as close relatives, friends, and neighbors. Using a kanga , a brightly colored rectangular cloth with elaborate designs, mothers carry babies close to their bodies in a sling, even while working in the fields, at home, or in shops. An essential multipurpose item of women's apparel, the kanga can also be used as a shawl, head cover, skirt, or dress. Daughters at very young ages begin helping their mothers care for their younger siblings. Child Rearing and Education. Until the age of five or so for boys, and until adolescence for girls, children have the most contact with their mothers, sisters, and other female relatives. Both boys and girls attend school if the parents can afford the fees. If there is not sufficient money for both to attend, the boy is usually favored, and the girl remains home to help her mother until she gets married and moves away. Students are supposed to respect their teachers, and corporal punishment is still practiced in Tanzanian schools. Among some ethnic groups, puberty ceremonies for boys and girls are practiced. Marking the transition to adulthood, such elaborate ceremonies may involve circumcision of boys and several kinds of genital surgery on girls. Unsterile surgical procedures performed on girls may have severe health consequences. Development programs have recently begun to make more use of the performing arts to deliver public service messages (about AIDS prevention and the importance of breast-feeding, for example). Higher Education. As fees for schooling have risen, families are finding it difficult to send their children to secondary schools. The wealthy send their older children to boarding schools both within and outside the country, although they worry that the materialistic influences of the modern world and lack of family supervision will negatively influence their children. Tanzanians are proud of their disciplined upbringing. The ability to keep control of one's temper and emotions in public is highly valued. Young men and women in rural areas are not supposed to show mutual affection in public in daylight, although this rule is often broken in urban centers. Boys and men, however, are commonly seen in public holding hands as a sign of friendship or camradarie. In many rural areas, women are not supposed to smoke, talk in a raised voice, or cross their legs while sitting or standing. Traditionally, elders are honored and respected by the rest of the community, although youth are increasingly challenging such customs as arranged marriages. 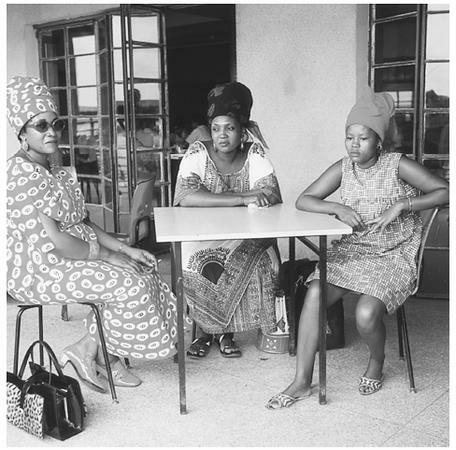 Three women relax in Tanzania. Successful women from ruling families enjoy many of the same privileges as men. rice and meat sauces, with the right hand. Children who attempt to eat with their left hands are disciplined appropriately at very early ages. This custom is related to the perceived symbolic purity of the right hand, compared to the left hand which is often used for cleaning after using the toilet. Religious Beliefs. Religious freedom is a virtue that has contributed to Tanzania's long, relatively peaceful history since the nation's independence. All religious holidays receive equal public recognition. Many world religions played a part in the nation's history. Islam began to be practiced as early as the twelfth century when Arab traders set up posts along the coast and on Zanzibar and Pemba Islands. The influence of Islam and Arab culture is strongly reflected in the Swahili language. Arab traders brought their religion to some interior settlements, but their proselytizing did not match the impact of the Christian missionaries during the German and British colonial periods in the first half of the twentieth century. Long before the influence of Islam or Christianity, indigenous belief systems shaped the cosmology of each ethnic group. The influence of these beliefs is still very strong; they are often practiced alone or alongside of the major religions. Virtually 100 percent of the people in Zanzibar are Muslim; on the mainland, about 40 percent are Christian, 35 percent are Muslim, and 20 percent follow indigenous religions. Among Asian minorities, the Hindu, Sikh, and Buddhist faiths are practiced. Christian sects include Catholics, Lutherans, Anglicans, Baptists, Presbyterians, and Orthodox. Both Christian and Islamic religions provide access to educational opportunities and often to some of the best medical care. Wealthy Muslims make their pilgrimage to Mecca, but this is a minority of the overall Muslim population. Religious holidays include Christmas (25 December); and Good Friday, Easter Monday, Idd-ul-Fitr, Islamic New Year, and the Prophet's Birthday (all of which fall on different dates every year). Idd-ul-Fitr is a Muslim festival and public holiday that is celebrated on the sighting of the new moon at the end of the calendar year. The exact date varies according to the new moon's position. Religious Practitioners. Native Tanzanians preside in all positions in major religions. In indigenous belief systems among some ethnic groups, certain people assume religious functions that often include healing. These indigenous religious practitioners differ significantly according to ethnic group. For example, in some cases among the Haya, the omufumu ("healer" in the Kihaya language) uses herbs and spiritual power to diagnose and cure illnesses. Acting spirit mediums, the Wazee ("Ancestors" or "Old ones" in Swahili) "come in to the omufumu's head" and speak through him or her. The Wazee have the ability to travel great distances and bring about a therapeutic cure, such as the recovery of stolen objects or even success in soccer matches. In some parts of the country, an indigenous religious practitioner, such as the omufumu in parts of northwest Tanzania, will survey a "football" or soccer field before a match to remove any object placed there to influence the course of the game by an opposing team. Death and the Afterlife. Death is a part of daily life for Tanzanians. In regions hit hard by the AIDS epidemic, families are often not able to afford the time or resources to follow traditional mourning and burial customs, which differ by religion and ethnic group. Among many ethnic groups, the "ancestors" assume an extremely important role. Ancestor spirits are remembered through various rituals and are believed to exert significant influence on daily life. For example, at drinking occasions, some people pour a small libation of beer onto the ground in respect of the ancestors. In other cases, a small vessel of beer is left in a special location as an offering to the ancestors. In still other cases, sacrifices of a chicken or goat, for example, are made to the ancestors in ceremonies that vary according to ethnicity. Similar to people in other poor, tropical nations, Tanzanians are challenged by numerous health problems, including parasitic, intestinal, nutritional, venereal, and respiratory diseases. In the mid-1990s, life expectancy at birth was forty-two years for men and forty-five years for women. Malaria, commonly referred to as the "Tanzanian flu," remains the leading cause of illness and death. Transmitted by the Anopheles mosquito, the parasite Plasmodium falciparum has become increasingly resistant to treatment. It is especially severe among children, the elderly, and people with compromised immune systems. Other common diseases include schistosomiasis, sleeping sickness, poliomyelitis, tuberculosis, and pneumonia. There are an estimated 150,000 cases of leprosy. Public health problems are further exacerbated by the nation's poverty, which makes proper food storage and the provision of adequate waste disposal and safe drinking water difficult to achieve. Nevertheless, technologically appropriate solutions to these and other public health problems, such as improved ventilated pit latrines, are increasingly being implemented. The Arusha Declaration for Tanzanian Socialism prepared the way to extend primary health care to the rural population. This led to the establishment of some three thousand rural health facilities and seventeen regional government hospitals. Although community health workers have been somewhat successful in alleviating health problems, the lack of medical supplies, facilities, and physicians continues to make confronting illness a primary survival issue. 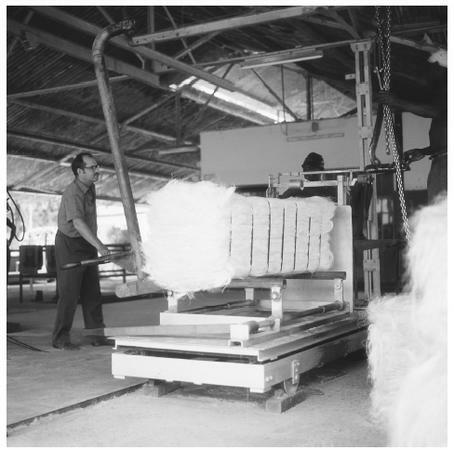 Manufacturing sisal at the Amboni Estate in Tanzania. rate, for example, has fallen from an estimated 86 percent to about 60 percent in recent years. Health problems have been exacerbated by AIDS which emerged in Tanzania in the mid-1980s. In 1998, the estimated HIV seroprevalence rate was 49.5 percent among high-risk populations in major cities and 13.7 percent among low-risk groups. In rural areas, the estimated HIV seroprevalence was 34.3 percent and 16.6 percent among high- and low-risk groups, respectively. AIDS has placed tremendous strain on an already challenged health care system; in some parts of the country, underlying HIV infection may be the primary reason for hospital admissions. It has been projected that Tanzania's economy will decrease 15–25 percent by 2010 as a result of the AIDS epidemic. The number of children orphaned due to deaths associated with AIDS is very high. The staggering number of AIDS-related deaths among young adults has placed serious strain on the extended family and the elderly, who are often called upon to care for the resulting orphans. All Tanzanian ethnic groups have highly sophisticated indigenous healing systems that help circumvent the inadequate supply of Western drugs and biomedical health services. The mganga , or "traditional healer" in Swahili, plays an extremely important role in health care, and treats chronic and infectious illnesses. In many cases, herbal remedies have established pharmaceutical efficacy. In addition, the mganga may also be called upon to treat social and "psychological" problems as well as problems not commonly perceived as "illnesses" by people outside of Africa, such as difficulty finding a lover, difficulty conceiving a child, or lack of success in business affairs. Predicated on a holistic approach to health, traditional healers treat body, mind, and spirit as an integrated system, often in the communal sense of the "social body." Faith healing among some Christian sects as well as various Islamic healing practices are also common. Although infectious diseases are the most visible health problems in Tanzania, social problems related to alcohol abuse are increasingly being recognized. Low-alcohol-content (approximately 5 percent) beers made from grains, fruits, palm sap, and honey play a vital role in almost all ethnic groups. Traditional beers are commonly consumed as part of nearly all ceremonies as well as being used in offerings to ancestors. While still used for these purposes, beer and other alcoholic beverages began to be sold as commodities in the postcolonial period, contributing greatly to social problems. The major state holidays are New Year's Day (1 January); Zanzibar Revolution Day (12 January); Union Day (26 April); International Workers' Day (1 May); Saba Saba (7 July, commemorating the establishment of TANU); Peasants' Day (8 August); and Independence Day (9 December). All holidays are celebrated with large amounts of food and alcohol at the appropriate time. The middle classes use days off to take outings with their families, watch soccer matches, or travel to see relatives. The formal development of the humanities and arts in Tanzania has been constrained by a severe lack of government and private funding. Tourists, the local elite, and expatriates support most of the fine artists, foremost among them the Makonde ebony carvers. While not as well known as Congolese or Senegalese singers, Tanzanian musicians are beginning to make their mark in the music world. Literature. Because most of the local languages in Tanzania are expressed orally rather than in written form, little other than dictionaries and collections of idioms and fables collected by missionaries or local and foreign researchers have been published. The national language of Kiswahili, however, has a very old and rich history. Stories, novels, poetry, epics, textbooks, children's literature, and historical treatises are widely available around the country. Graphic Arts. A thriving tourist industry supports thousands of artisans in Tanzania, the most famous being the Makonde carvers of ebony from the extreme southeast corner of the country. Other tourist items include paintings and greeting cards of landscapes, local peoples, and wildlife; intricately woven baskets; soapstone, ceramic, and malachite carvings and jewelry; woven or printed wall hangings, and decorative and functional objects formed from banana leaves and coconut hulls. Performance Arts. Individual tribes are characterized in part by distinctive theatrical performances, dances, and music—for example, the Snake Dance performed by the Sukuma people in the north-central part of the country. Some of these groups are invited to Dar es Salaam to honor the president, ministers, or foreign dignitaries. Occasionally, private or state funding is found to send them to foreign capitals to perform. While not as well known as Congolese, Malian, or Senegalese singers, Tanzanian musicians are beginning to make their mark in the music world. Theater, dance, and music skits on radio and television are also being used by churches, state agencies, and development organizations to relay public service messages about such topics as AIDS, corruption, vaccination campaigns, and contraception. Lack of funding has also constrained the development of the physical and social sciences in Tanzania. Like Makerere University in Uganda, the University of Dar es Salaam was once one of the leading centers of critical socialist thought in Africa. While it still attracts some of the world's foremost thinkers and philosophers, the university currently suffers from substandard infrastructure, an inadequate library, and poorly paid but internationally recognized professors. Airhihenbuwa, Collins O. "Perspectives on AIDS in Africa: Strategies for Prevention and Control." AIDS Education and Prevention 1 (1): 57–69, 1989. Beidelman, T. O. The Matrilineal Peoples of Eastern Tanzania , 1967. Briggs, Philip. Guide to Tanzania , 1967. Carlson, Robert G. "Haya Worldview and Ethos: An Ethnography of Alcohol Production and Consumption in Bukoba, Tanzania." Ph.D. thesis, University of Illinois at Urbana-Champaign, 1989. ——. "Symbolic Mediation and Commoditization: A Critical Examination of Alcohol Use among the Haya of Bukoba, Tanzania." Medical Anthropology 15: 41–62, 1992. Coulson, Andrew, ed. African Socialism in Practice: The Tanzanian Experience , 1979. Duggan, William Redman and John R. Civille. Tanzania and Nyerere: A Study of Ujamaa and Nationhood , 1976. Eriksen, Stein Sundstol. "Between a Rock and a Hard Place: Development Planning in Tanzanian Local Governments." Third World Planning Review 19 (3): 251–269, 1997. Fivawo, Margaret. 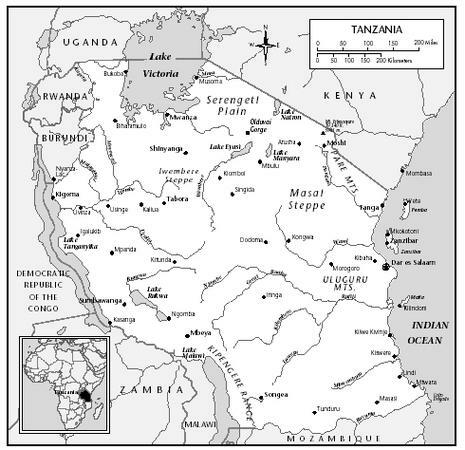 "Community Response to Malaria: Muhezae District, Tanzania 1983–1984: A Study in Cultural Adaptation." Journal of the Steward Anthropological Society 21: 1–151, 1993. Goodall, Jane. The Chimpanzees of Gombe: Patterns of Behavior , 1986. Heggenhougen, Kris, Patrick Vaughan, Eustace P. Y. Muhondwa, and J. Rutabanzibwa-Ngaiza. Community Health Workers: The Tanzanian Experience , 1987. Heilman, Bruce. "Who Are the Indigenous Tanzanians? Competing Conceptions of Tanzanian Citizenship in the Business Community." Africa Today 45 (3–4): 369–387, 1998. Kimambo, I. N., and A. J. Temu, eds. A History of Tanzania , 1969. Knappert, Jan. East Africa: Kenya, Tanzania & Uganda , 1987. Lugalla, Joe L. P. "Development, Change, and Poverty in the Informal Sector during the Era of Structural Adjustments in Tanzania." Canadian Journal of African Studies 31: 3, 1997. Kwesigabo, G., J. Z. J. Killewo, A. Sandstrom, S. Winani, F. S. Mhalu, G. Biberfeld, and S. Wali. "Prevalence of HIV Infection among Hospital Patients in North West Tanzania." AIDS CARE 11 (1): 87–93, 1999. Mlozi, Malongo. "Urban Agriculture: Ethnicity, Cattle Raising, and Some Environmental Implications in the City of Dar es Salaam, Tanzania." African Studies Review 40 (3): 1–28, 1997. Ofcansky, Thomas P., and Rodger Yeager, eds. Historical Dictionary of Tanzania , 1997. Nyoni, Timothy S. "Foreign Aid and Economic Performance in Tanzania." World Development 26 (7): 1235–1240, 1998. Phillipson, D. W. The Later Prehistory of Eastern and Southern Africa , 1977. Polomé, Edgar, and C. P. Hill, eds. Language in Tanzania , 1980. Pratt, Marion. "Useful Disasters: The Complexity of Response to Stress in Tropical Lake Ecosystems." Anthropologica (special issue), winter 1998. Rugumamu, Severine M. Lethal Aid: The Illusion of Socialism and Self-Reliance in Tanzania , 1997. Rutayuga, John B. K. "Assistance to AIDS Orphans within the Family/Kinship System and Local Institutions: A Program for East Africa." AIDS Education and Prevention , fall 1992 supplement, 57–68. Seppala, Pekka, and Bertha Koda. The Making of a Periphery: Economic Development and Cultural Encounters in Southern Tanzania , 1998. Sofoluwe, G. O., R. Schram, and D. A. Ogunmekan. Principles and Practice of Public Health in Africa , vol. 1, 1996. Tripp, Aili Mari. Changing the Rules: The Politics of Liberalization and the Urban Informal Economy in Tanzania , 1997. Waters,Tony. "Beyond Structural Adjustment: State and Market in a Rural Tanzanian Village." African Studies Review 40 (2): 59–89, 1997. Yeager, Rodger. Tanzania: An African Experiment , 2nd ed., 1989. Yudkin, John S. "Tanzania: Still Optimistic after All These Years?" Lancet 353: 1519–1521, 1999. I am in school and we are doing MODEL UNITED NATIONS and, luckily, my country is Tanzania. I agree mostly with the article on the health, AIDS, and just about everything else, but there wasnt much about environmental stuff in which we most need. Thank you for reading this. I am doing a project at school and my topic is Around the World in 40 Days. My first country is Tanzania and this page has answered almost all of my questions. The only one i needed was flora and fauna. Thanks! I'm organising TANZANIA Food and Culture exhibiton for the Gwledd Conwy Feast in North Wales on october 27-28, 2007. Thank your contribution through this article. Ireal appriciate your work it's ral good.Im a Tanzania living out of the country ,your article hellped me to fulfill my reasech. it helped me in my studies at Agakhan University. Thank you so much! Our sons have recently made a new friend from Tanzania. This helped explain his culture to my boys. Thank you!! I am original a Tanzanian , a real Bantu from Kilimanjaro. I am happy to read about the facts of my lovely country Tanzania. I have been living in abroad for many years you site made me to feel like i am in TZ oh I am home sick now i have to go home sweet home. Thanks and keep it going. )May God Bless you. I am Tanzanian studying in Uganda. For the moment I am doing a research on wapigadebe. I very impressed to read this article and know more about my country. The article is very important especially for us youths and will help us to keep what we are suppose to keep and solve our problems as our culture guides us. Wishing you all the best! God bless Africa! God bless Tanzania! I am doing a presentation of Tanzania. Thank you for your information. It does help me but the important things I need are communication and recreation. Hi!Im a Filipina working in UAE as Human Resources & Training Manager, this website helps me to know more about the COuntry!Hope one day I will be able to visit there!God Bles! on tanzania culture and dance. keep it up for other country culture ! Thank you so much for putting up this site! I love that youb have just the facts i need for school! As matter of facts,the article is ok,though lacks details about Population history of tanzania. Thanks for that facts about Tanzania. Thank you so much for infoming us a lot about our culture. Continue doing project if possible to other social aspects. Thank you very much this site has been exceptional. I have been able to find out about both Tanzania and Colombia for my report in great detail. It would be great if you could add a section on tourism for the countries. Thanks again. Thanks very much for providing rich information about Tanzania, I am on process of organizing an event about Tanzania & Disability; you have helped me to gather all necessary information i needed about Tanzania, though i couldn't get enough information on disability. Well done all of you, it is an excellent work you have done! I am doin a project about tanzania an its was very helpful about history in the old times in tanzania. i am doing a presentation on Tanzania, this article helped me a lot. thanks! this helped me a lot for my report thanks! I used it on a lot of things for it thanks! this website really helped me do my project on Tanzania's culture. And i think you should carry on updating it with more information about Tanzania, so that we can use it to in future projects!! Fantastic site. Used it a lot for background info on my MA thesis, a comparative study on legitimacy and development in East Africa. Just wanted to correct a single error. The current population in TZA is listed in the CIA World Factbook as being 41,048,532 (and not 30 million as the article says). Thanks again. Keep up the good work. Love it! How do you make samosas?Thank you for this really good information! this site is good for those who wishes to undertake studies in Tanzanian culture and peoples around East Africa. I wish every body could read this even it lack some facts about the originality what has presented but atleast researchers can get a good start. I am a Tanzanian Medical Doctor who partly was trained in Tanzania and mostly worked in Rural Tanzania.This is a very educative piece of document for Tanzania worth for internal and external persons.I do recommend frequent updating of data.Thanks. Material is of great intrest. some focus on food habits and vegetarian stuff could also be covered. I think that it is just amazing what tanzania goes through in a day it is just crazy this has really been an eye opener for me! my name is claude. i loved this website and i wanted to share it. it reminded me of where i came from. tanzania. i miss my counrty so much that i want to go back there. there are some things that i just learned on this website about tanzania that i did not know even though i lived over there for ten years. i like to thank who ever created this website. I was doing a project on Tanzania for my Right to play project. This really helped me make a pillar for my country I was doing and I finished it with all my answers filed out beucase of this site. Thankyou!! tanzanianculture,differnt tribes in tanzania and their economic activities. Thanks for sharing with us about the history and culture of Tanzania. It is very informative where someone from elsewhere could read and understand our nation. My major comment is that try as much as you can to update some information like the current population of Tanzania is not only 30millions people; I'm sure its about 42millions and some alike information. Otherwise, thank you for making Tanzania known worldwide. Keep in up! waoh i love my country, and im very happy to hear things like this, im proud to be tanzanian. I'm writing a report about the different cultural aspects of Tanzania and this article has by far provided me with the most tangible information. Thanks a lot! Am a ugandan migrant in South Africa surey ive to recommend the person who wrote this article i wish u success in all your effortS the article has given me beyond what BEYOND expection. I wish that u could attach pictures of each mojar city eg.dar-ul salaam Mwanza etc...this must be made a unique book which can attract the youth of Africa,East Africa AAND Tz inperticular just a suggestion thanks. Well, I think this article answers most of the questions about our culture and nation in general. So I recommend to many of my foreign friends. I am Tanzanian music and fine artist, and history means a lot when it comes to arts. So nasema hii ni poa sana! Thank you very much for your information about Tanganyika/tanzania.I am a ugandan who would like to be given a rich information about Mr HERI who is said to have Migrated to Uganda in 1887. from the little information i have he claimed to have hailed from Tabora and he was of the Zigua tribe.but he begot off springs here in Uganda and after a along generation iam a descendant as well but i would like to get enough information about this man and this is where i have started my reseacrh about him. Thank you very much ALLAH BLESS YOU. I am an ex-student of Makumira University College.I appreciate the culture of Tanzanian women.They have demonstrated with respect that they can play the same role as men.I encourage the whole community of Tanzania to maintain your culture and make change when you will judge that it is necessary.Now I am a student at The College of Brockport,State University I have remarked the differences. This site really helped me understand the Tanzanian Culture. It covers every thing I need! Ther should really be more sites like this for other African cultures. Thanks for your effort of collecting such wonderful information,it has helped me much in my classwork,I'm from Bugema University Kampala Uganda. This article helped me so much! I am doing a report on Tanzania, and this is where I got most of my research. Thank you! Am glad that I have widerned my knowledge about my country though this article. It also helped me in accomplishing my assignments and attempting some questions at St. Augustine Universty Of Tanzania. Much thanx to the whole team who made this. Im Tanzania from KILIMANJARO im so happy to have the site that gives out true culture of Tanzania. Im so happy indeed . Gob bless you and keep it uptudate. Thanks very much for explaining more about my culture, my country and about our life especially women who live in bad condition: God bless you and your hand for writing this site. Thanks very much for your explanation but i want to know more about our currently Tanzania,where are we going? I REALLY GOT A SENSE OF THE UNIQUE NATURE OF THE AFRICAN PEOPLE IT DID HELP ME VERY MUCH DURING MY STUDIES. It so nice to teach and remind us about our Culture of Tanzania - history, people, clothing, traditions, women, beliefs, food, customs, family your Trueman of God be blessed!asante sana ! I got something in your data. God bless u. So with the respect to our culture in Tanzania,what causes of oral English Language problems among sec. school students in Tanzania? Great coverage n this blog, looking to hear on the frequent occuring deseases in Tanzania and health services seeking behaviour for Rural population towards attaining millenium goals. Thanks to all who participated n publishing this article. very interesting sort of imformation,am a Tanzanian purshuing for socilogy studies at open university, Lindi centre. basicaly the valuable imformation which is the content of this report willmuch in my undergraduate course in sociology. its very nice of us to know the history and culture of our country. my supervisor gave a task to present the culture of my country, real i was happy because when i read this website it read helped me a lot. but still modification and updates are very important. Thanks for the big team that has analyzed and elaborated in details about this awesome neighbouring country. I've gathered a lot of information about Tanzania's culture, education, IT and politics. I'm a Kenyan Patriot/Citizen. i miss my county! when i get to ready this i start missing my island. i miss my friends and other people. I study at the institute of accountancy Arusha here in Tanzania..Tanzania is my home and i love everything about it.I welcome anyone who would love to visit and see how beautiful it is in different geographical, cultural and social aspects in general...You will be so much amazed with it..God bless Tanzania and God bless you all..
the article is great, it emphamzise almost everything i need,iwould love to know more about their dressing? which someone can lean from. thanks alot 4 keeping me 2knw this matter. I like Tanzania, and i wish to write something about Tanzania culture.This article is helpfull.THANKS A LOT.I AM STUDENT IN ITALY.TANZANIA IS MY COUNTRY. Thank you for all the information on Tanzania. I have to write about a country of its culture and tradition and all the this information is really well summarized in this website. MY GOD I LIKE TANZANIA CULTURE.THANK YOU SO MUCH FOR GOOD ANALYSIS. i need information about Tanzaian people are they group focused or they like to do everything individually?? This was really helpful for my school project, but I was just hoping it was going to have more information on daily life, such as music, sports, or clothing. The article is really interesting.I have poor background in Tanzania history, through this, my history has been sharpenned.I'm doing my postgraduate studies in kenya.At least I can narrate a lot about tanzania to my classmets. Thanks, well done, keep on updating. Thanks a bunch! This is really helpful for school projects and interesting too. I have read the artical and find it very interesting, I am in south Africa and I secure one of the largest sea ports in South Africa and I have found an increase in Tanzanian men trying to access the port with the intention of elligally getting on board the ships and hiding in the ships to go over seas to Europe and America and the port security is forced to arrest these men. I am trying to find out why so many Tanzanian people are leaving Tanzania for South Africa and then trying to go over seas on ships. There are alot of different people from different countries in Africa that live in South Africa but I find that only Tanzanian men are trying to leave South Africa on ships to go over seas. Tanzania and South Africa are such beautiful countries so why would they want to leave. ALL IN ALL WE MUST THANK GOD FOR HELP US TO LIVE IN PEACE, GOD BLESS TANZANIA. I travelled on safari through Kenya and Tanzania in September 2012. Loved the animals but the people were amazing! Economically they don't have much but that makes up for their big hearts! Can't wait to go back soon. Why was Tanzania political administration moved from Dare se salaam to centrally city of Dodoma? I hail from Bukoba, and my grandmother was a Muhaya. I grew up hearing stories of past kings and their feats. also strange ways of travelling, people moving from one place to another in fantastic ways with great speed. instead of investigating the sources of this tale, modern people prefer to call thhis, witchcraft. thanks for your article will help me in my studies. I am an Indian, now I am here in Uganda. As I wanted to visit Tanjania, the site is very useful. The culture and people are good with their customs. But they should work hard and women also give respect as we do in India. Thank You. Hello! I was invited to a Tanzanian weeding which will take place in Europe, however majority of guests will come from Tanzania. My boyfriend will be best man and we're both European. This website helped me a lot because it showed me the Tanzanian culture and the ways of the Tanzanians. I think the culture of the tanzania is wonderful. they look like wonderful people and i would like to travel to tanzania aome day . i go to Hilltonia middle school in columbus ohio and i am studying their culture . and so far i love it all the wonderful things they do its very nice!!! be proud to know the history of your country and restructure it where it had been distorted. It is good, the information are very basic , more update should be done in regard to different categories, the growing cities and the activities like education,and food availabilty. IT REALLY HELPED ME WHEN WE HAD A PROJECT ON TANZANIA AND ITS REALLY HELPFUL WHEN I NEEDED NOTES. Was glad to read about the history and culture of tanzania.My late father was originaly from tanzania frm a village called nsumbu wanga. I would like to know more about this place.Its inhabitants, tribes, staple food ,structural makeup etc.Father never brought us over to visit his kins and hence we, ve grown up only knowing our mothers kins on the zambian side. I have gone through this article, and have enjoyed the information given. The author touched almost every corner to describe the country of Tanzania. That's a credit. However, there are information that I was looking forward to see in this article but couldn't see them, speaking of detailed information about the architecture of Tanzania, the landscape architecture of Tanzania, especially being specific to the tribes found in Tanzania, juxtaposition of foreign architectural elements in the existing buildings, these are less or not explained. This article is helpful as it gives an overview of what was/ is happening in Tanzania. An improvement of the article would add more values and strengths. Its me, Graduate Landscape Architect, currently Master of Architecture student, Ardhi University, Tanzania. This is amazingly resourceful. Thanks a lot. I'm a Nigerian with much interest to visit Tanzania soon. Thanks to author of this article, it explains most of the information required. However, many Tanzanian are still asking many questions. 1. What was the consideration on boundaries demarcations? If Burundi, Tanzania (Tanganyika), Rwanda made one country before 1920, what was the name of the three countries? What are the original of Burundi and Rwanda names? Nyerere told us that the original of Tanganyika name is not creally known! We cannot trace? We know already the person who named Tanzania, why not Tanganyika? Did Zanzibar get independence from Britain? If not which government was overthrown by The Zanzibar revolutions government? This was a interesting article. Is there an article concerning the years 2000 and now. It seems so sad for a strong people. I ave a small speech on Tanzania in February with my friends and this site as very informative and helpful. I am working on a project for school and i cant figure out the movement of goods and the people in tanzania but the most of this helped out with my project.